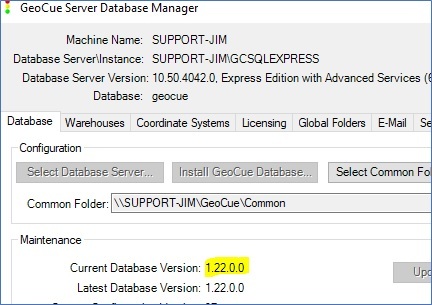 Each installation of GeoCue should automatically update the SQL Database to the latest version. Sometimes this will fail to happen. This can be seen in the GeoCue Database Manager dialog under the Database tab in the lower Maintenance section. It will show the current database version in use and the latest database version available. Ideally, the two versions displayed should be identical. The naming scheme for the update files corresponds to the database version number but without the decimals and with the addition of a zero at the beginning, the middle, and the end of the sequence. For example: the update file for database version ‘1.22.0.0’ is ‘01220000.sql’. You will need to manually execute the updates in sequence in ascending order beginning with the next update for your version and ending with the latest version update. For example: if my database version is 1.20.40 and the latest version available is 1.22.0.0 then I would need to execute the following updates in sequence: 01210000 and 01220000. To execute these updates, open your SQL Server Management Studio, open the file that contains the sql update files and select the first required update file. 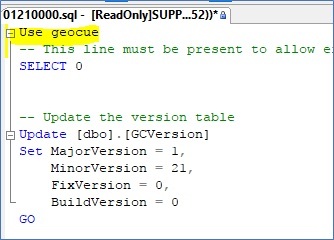 Insert “Use geocue” at the top of the text and execute. SQL Server Management Studio. Server name used in example is “geocue”. You might receive messages like in the example below, but disregard. Repeat the same steps for each subsequent update until your Database Manager indicates that your Current Database version is also the latest version. This entry was posted in GeoCue Installation, Licensing and Updates and tagged Database, database manager, server, SQL, studio, update SQL.